In 2013 Zika arrived in French Polynesia (pop. 276,000), and quite unexpectedly, we began get reports of more severe illness associated with Zika infection than had ever been reported before (see Zika, Dengue & Unusual Rates Of Guillain Barre Syndrome In French Polynesia). The number of GBS cases was small, but estimated to be 20 times greater (cite Eurosurveillance) than normal. we looked at the first case-control study to be published on that outbreak, and it seems to confirm what we've been seeing over the past few months in the Americas; an increased incidence of GBS cases associated with Zika Virus infection. Today the World Health Organization has published a review of that study, and a risk assessment, that characterizes these findings as providing `strong evidence of a possible causal relationship between Zika virus infection and GBS' and warns that `it is likely that countries that are currently reporting autochthonous Zika virus transmission will face a rise in the number of GBS cases in the coming months'. On 24 November 2015, health authorities in French Polynesia reported unknown and unspecified causes of morbidity and mortality in the context of concomitant outbreaks of Zika and dengue (serotypes 1 and 3) viruses. This update provides additional information on the clinical findings as well as the epidemiological and laboratory investigations of these cases. Between October 2013 and April 2014, French Polynesia experienced the largest Zika virus outbreak ever recorded in the country. During this period of time, 32,000 patients (11.5% of the population) were assessed for the infection and 8,750 suspected cases were reported by the national surveillance system. Of the suspected cases, 383 were later laboratory-confirmed by reverse transcription polymerase chain reaction (RT-PCR). During the Zika virus outbreak, 42 patients were admitted to hospital with Guillain-Barré syndrome (GBS). This represents a 20-fold increase in incidence of GBS in French Polynesia compared with the previous four years. Of the 42 patients, 16 (38%) required admission to an intensive care unit (ICU) and 12 (29%) received mechanical ventilation. The duration of hospital stay for patients that were not admitted to ICU ranged between 7 to 20 days (median=11). The duration of hospital stay for patients that were admitted to intensive care went from 16 to 70 days (median=51). No deaths were reported. The majority of these cases (88%) reported symptomatic Zika virus infection in the days (median=6) that preceded the onset of neurological symptoms. Further investigations were carried out to identify the potential role of previous infections known to be associated, or potentially associated, with GBS. 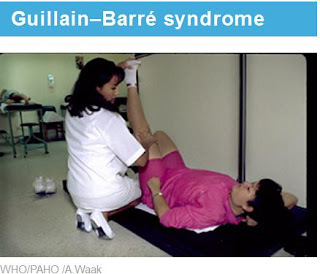 The investigations carried out by the Bureau de Veille Sanitaire-Direction de la Santé de Polynésie Française showed that 41 of the 42 cases of GBS (98%) had IgM or IgG antibodies against Zika virus; furthermore, all GBS cases (100%) had positive seroneutralisation against Zika virus. Results for the matched non-febrile illness control group were significantly different: elevated IgM or IgG antibodies were detected in 35 of the 98 control patients (36%); additionally, neutralising antibodies against Zika virus were detected in 54 control patients (56%). Analysis of dengue serology (immunofluorescent assay, microsphere immunoassay, and seroneutralisation) did not support recent dengue infection, even though most cases (95%) had pre-existing dengue immunity. Other known causes of GBS were investigated and excluded, including Campylobacter jejuni, Cytomegalovirus, HIV, Epstein–Barr and Herpes simplex viruses. This is the first report of a large number of patients who developed GBS after contracting Zika virus. The study provides strong evidence of a possible causal relationship between Zika virus infection and GBS. Since all 42 cases had serological tests suggesting successive dengue and Zika virus infections, this association might be a predisposing factor for developing GBS. Further investigations are needed to understand the implications of pre-existing dengue infections, together with recent Zika infections, in the pathogenesis of GBS. Similarly to French Polynesia, it is likely that countries that are currently reporting autochthonous Zika virus transmission will face a rise in the number of GBS cases in the coming months. A number of countries in Latin America have already started to report an increase in the incidence of GBS while experiencing a rise in the cases of Zika virus infection. Nevertheless, it is critical to ensure that in all these countries, the reported increases in the incidence of GBS are the result of a real change rather than enhanced surveillance. WHO continues to monitor the epidemiological situation and conduct risk assessment based on the latest available information. raise awareness among health care workers and establish and/or strengthen links between public health services and clinicians in the public and private sectors.